Home / What Causes a Collapsed Drain? What Causes a Collapsed Drain? A collapsed drain can be a nightmare situation for homeowners and business owners alike, resulting in blockages and overflowing drains that can look and smell awful as well as reduce the hygiene of your premises. If your drain has collapsed, it is crucial you identify and tackle the problem as soon as possible, but it is always a good idea to be aware of the causes of collapsed drains so you can work to prevent it occurring to your sewer systems in the first instance. Here, Wildon UK will talk you through the causes of collapsed drains and some preventative measures you can take to keep your sewers and drains protected. Tree root damage – If there are trees growing near to your drains, the roots can grow down or around the drain lines and cause breakages in the pipes. The longer you leave this unchecked, the more damage that the tree will cause, until eventually your drains collapse and your waste water leaks into the surrounding ground, creating a large, marshy area that will begin to attract flies and other pests. Tree root damage has been noted to be a particular problem when dealing with older drainage solutions such as Orangeburg sewers. Wear and tear – General wear and tear is to be expected, especially if your pipes are old. The material your pipes are made from begins to weaken and deteriorate over time; this means that the weight of the earth settling on top of the pipes can cause the weaker material to collapse in on itself. Hopefully, this will only happen in one small section which can be replaced rather than having to install a whole new system. If your pipes are particularly old, however, it may be prudent and more cost effective to replace the entire structure to save the cost and hassle of many frequent repairs. Drains and pipes freezing – During the cold winter months our pipes are subjected to immense pressure as the water in the ground surrounding them goes through a cycle of freezing and thawing. Frozen ground expands, heaving upwards before thawing and settling back down on the pipes. 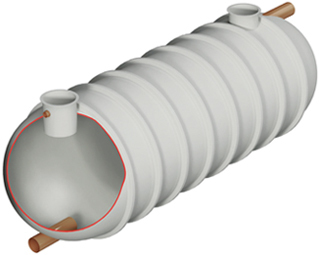 This pressure can cause the pipes to begin to sag, and if the pressure continues, the pipes can completely collapse. Ground movement – Whether the ground movement is caused by freezing and thawing, slope instability or stress-state changes, any sort of disruption to the ground surrounding pipelines can place a very heavy load onto the pipes and cause them to fracture and break or cause the pipes to misalign. Use chemicals to kill off the roots of trees growing close to your sewer lines or, alternatively, a physical barrier can be used to discourage the roots from growing towards your pipes. Replace aging pipes with a more durable material. Have your pipes regularly inspected, cleaned and maintained by expert contractors. If you suspect you have a collapsed drain, get in contact with your local sewage and drainage experts for an emergency call out. Wildon UK are on hand 24 hours a day to help with emergencies. Wildon UK have 20 years’ experience in installing and maintaining sewage treatment pumps, plants and pumping stations for domestic, commercial and agricultural sectors throughout the entirety of the UK. We have highly trained staff and fast response times, so you can be confident that we can assist you with your sewage issues quickly and professionally. Get in contact today to find out more; we’re always happy to assist with customer enquiries.